Welcome to the City of Toledo IA. A small town located in the center of the state of Iowa. 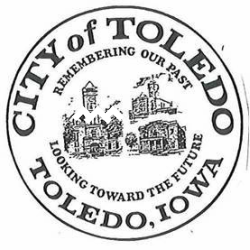 Toledo was chosen the county seat of Tama County in 1853 and its downtown area is full of landmarks on the National Register of Historic Places including the Tama County Courthouse which was built in 1866 at a cost of $25,000. The Wieting Theater was built in 1912 and given to the people of Toledo by Mrs. Philip Wieting in memory of her husband. The former Toledo fire station was built in 1875 and has been completely renovated into a private residence and features a swimming pool and elevator. Hotel Toledo was built in 1901 and still serves travelers and permanent guests; its lobby has a marble floor, elegant beamed ceiling and grand fireplace. The Tama County Historical Museum and Genealogical Library is housed in the former county jail which was built in 1870; a restored log cabin is on site.Toledo is home to the original “Butter Cow Lady”, Norma (Duffy) Lyon. A bronze cow/calf sculpture was erected on the hilltop at the intersection of Highways 30 & 63 in her honor and the Toledo Library has a display case dedicated to her achievements. 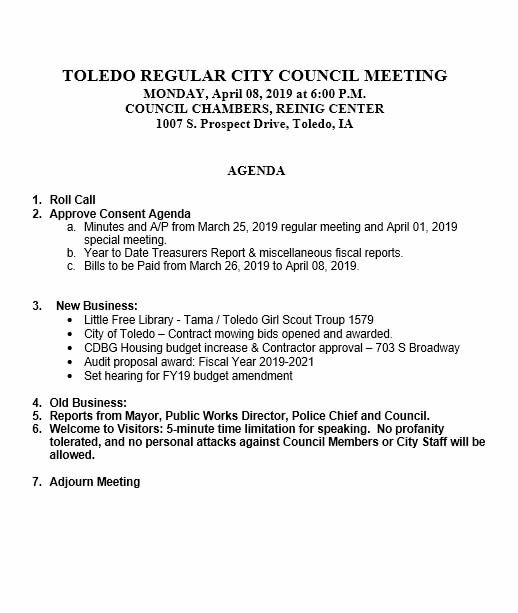 The City of Toledo Brush Pile is open at all times. Please remember that this is a brush pile, do not leave garbage or construction material at this site.